Have you been experiencing lower than expected conversion rates? There are a lot many reasons why a landing page might perform poorly. From the quality of the content to small things like the design of the ‘call to action’ (CTA) button, everything matters. A CTA button is virtually the last step that ensures that the audience reacts positively to a piece of information – be it buying, subscribing or leaving a feedback. Experienced web designers and developers already stress a lot in coming up with the best possible CTA graphics, based on the personality of the brand, the products/services you are trying to sell/pitch and the expectations of the customer. To make things easier at your end, here are some incredible and fresh designs for CTA buttons. Offering a highly versatile and handy set of CTA buttons for any kind of website design project; this set contains fully customizable vector sets. You get fifteen different buttons that are further open to editing. A font file is included with the set to help you make your own buttons. If the design of the web page demands that you look out for a round call to action button, this collection can fit perfectly. Available in five different colors, they create 3D like illusion, one that can be pressed to respond to the content. The text inside the buttons can be customized according to your requirement. However, it is advised that you keep it short. Offering a lot of space to force an action, this high quality ‘Call to action’ buttons can be an asset to your landing page. The text here can be completely customized and you can choose among “Add to Cart”, “Get Started”, “Subscribe Now”, “Download Now” and other CTAs. Here are twelve high helpful CTA that can become a perfect solution to any website design. All buttons are available as PSD files with added ASL layer styles. This makes it easy to apply these styles to any other shape of button you are trying to create. Further, every style of button comes in two sizes to match your precise requirements. Colors add a lot of personality to any website and also stand for the brand image. Here’s an incredible set of thirty two dark web action buttons that can be an asset for any web designer / developer. All the buttons come as vector shapes and can be resized to fit your design aesthetics. Further, you can also change the color of a button while adopting the right shape for your overall design. Flat web buttons are incredible as they match with most design schemes and grab the attention well without trying to stand out. Available in very high resolution, you can always customize the text and color of these buttons. Made out of the simplest fonts, these icons represent the popular and intuitive web design styles that the web space follows. Free fonts and icons have been used in these buttons to make your landing page look good and perform well. 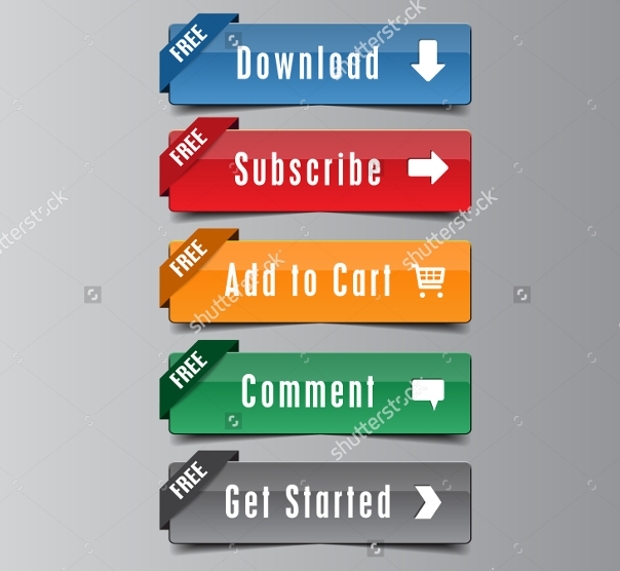 Asset of 28 Call to action web buttons, including video buttons, you will definitely get what you have come looking for. All buttons are fully customizable. Featuring all the commonly used CTAs, these buttons come in a simplistic design and can form a part of any web experience. Customize the text and color to meet your requirements. Bright and fresh, this set of 28 CTA will add life to any web page and is most likely to increase website conversions. Hope you have found what you have been looking for. Do share what you have done with these buttons. It will be interesting to browse through your websites!